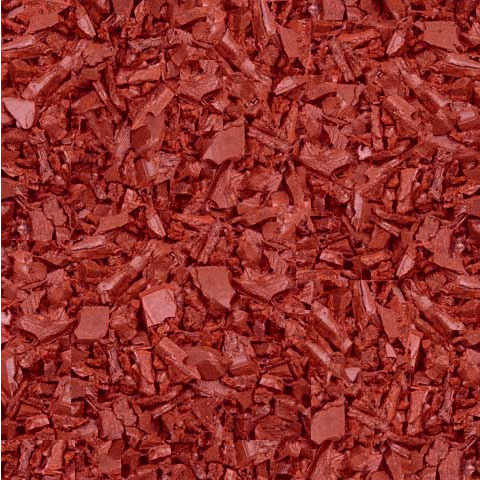 Premium recycled rubber mulch with toxic free red dye. Please note: If you need a quantity such as 1.5 or 2.5 tons etc, please call us at 800-778-6852. 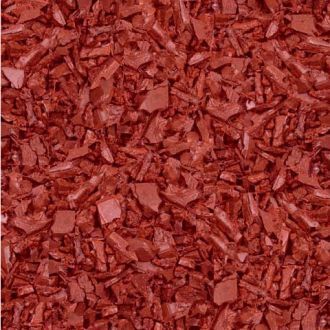 Dyed rubber mulch is made from recycled tires and then dyed using non-toxic, highly durable paint. Because it is dyed, the color will last longer than that of natural mulches. Favored by low maintenance gardeners looking for exceptional weed control and long color life, rubber mulch can save time and money over conventional mulches as it lasts for well over a decade. Because you do not have to re-apply rubber mulch every year, you can save up to 65% over 5 years compared to traditional wood mulch. You save not only the costs of buying new mulch, but also on the labor (and hassle) of re-applying it on a yearly basis. "Rubber mulch can eliminate the need for annual mulching, since rubber doesn’t break down as wood does; it’s heavy enough to stay put; and you can use less of it than wood mulch: Rubber mulch need be only 1.5 inches deep vs. about 3 inches for wood mulch." We recommend a 2" depth in order to prevent weed seed from reaching the soil. Use our calculator to determine the amount of mulch needed for your landscaping needs. Over the past two years, I have ordered three skids of red mulch. 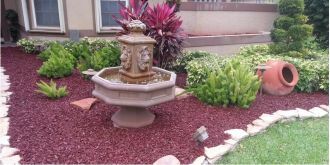 My yard looks beautiful, the color is great and the prices are better than competitors. I have friends who have visited and praised the appearance and as a result ordered the mulch. Initially the cost of the rubber mulch is higher than the wooden mulch but will out last the life expectancy of the wooden mulch and therefore over time the rubber mulch will be more cost effective. Great stuff! I like it nice product looks nice , only down about it not as bright red as shown on web site much darker than expected but other than that like it so far . Our order of Mulch was delivered in a timely fashion, Offloading was exceptional, the quality of the product is exactly as described. However, will not be able to determine until after winter whether or not it will live up to expectations. Overall, very satisfied with this product. The mulch is awesome...exactly what I was anticipating it to be. Nice red color in nice sized bags, easy to manage. I replaced all the mulch around my whole house by myself. There was a problem with the delivery initially and it did not get delivered on the day they said due to some issues with equipment, but they came through and got it to me for the weekend when I needed it! Thank you very much!! I ordered the red mulch. The product is great. It has really made a difference in the appearance of my home. My only regret is that I only ordered 2 pallets. I wish I had ordered 3 . I will save up and order more next year to finish the back of my home. Order arrived quickly. Curbside delivery was adequate for our needs. It took some time to remove all of our old wood mulch, but after this the rubber went down quickly. We are very satisfied. I hope we are through replacing mulch every year. Unbelievable fast delivery - less than a week and only because I couldn't receive it sooner. Product looks great though I haven't had time to put on landscape yet. Easily to handle with 50 40# pound bags. Mulch was as expected. Truck driver moved pallet into my driveway. Ordered a second pallet to continue my border project. Looks good still on ground, neighbors are thinking of doing it too. Thought everything went perfect. Edging was exactly what we were looking for, rubber chips are great though if I was to be picky I thought the color would cover a little bit better other than that it could not have gone any smoother . Your service people were great. Delivery was prompt and quality of mulch met my expectations. When I realized I needed more pallets - I simply emailed and they took great care of me. More pallets were needed than anticipated but that's my fault. We received our order very quickly. It was delivered just as expected. The bags were neatly stacked on a pallet and securely wrapped in plastic. No bags were broken. The driver was courteous and placed the pallet at the edge of our driveway. Handling the bags was easy. We replaced our wood mulch with the rubber. It looks great. My wife is very happy. Hope this lasts a good long time. What are the benefits of rubber mulch in playgrounds? One advantage of rubber mulch over other playground surfaces is it's elasticity or "spring". Rubber mulch's elasticity gives it a springy quality when used in thicker layers of 3 - 6 inches. Rubber mulch is a natural choice for playgrounds. Where does the rubber come from? Rubber Mulch is made of 100% recycled tires. How long will Rubber Mulch hold its color? 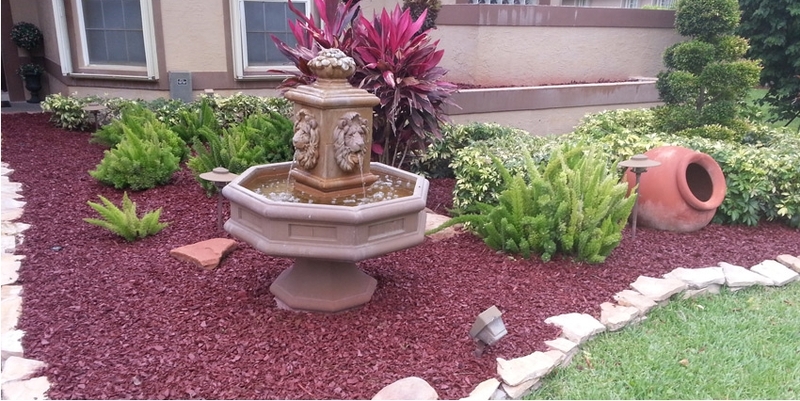 Rubber Mulch from Mulch Direct will not fade in most environments for up to 12 years or more. We guarantee it. Once opened, Mulch Direct Rubber Mulch has an odor initially. However, within 48 hours, the smell will dissipate. Is Mulch Direct Rubber Mulch dirty? Mulch Direct Rubber Mulch is colored using a licensed process and seals the rubber after the desired color is applied. Will Rubber Mulch stain clothes? Unlike organic materials, Rubber Mulch will not stain clothes. How is Mulch Direct Rubber Mulch packaged? We offer both 40lb bags and 2,000lb supersacks. 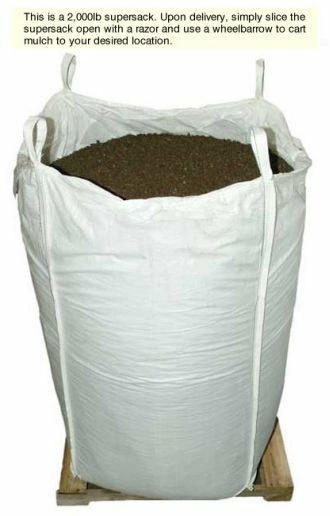 A Supersack is a container-big bag, also known as bulk bag that contains approximately 2,000 lbs. How much rubber mulch will I need? Rubber Mulch can be used for many applications, please refer to our Rubber Mulch Calculator to give you an accurate estimate on how much you will need or call us at 800-778-6852 and we can assist you in calculating how much you need. How do I install Rubber Mulch? The most ideal way to install rubber mulch is over a weed fabric. We recommend using a weed fabric and not a plastic material because plastic is not permeable. When installing rubber mulch over a weed fabric, you will never have any weed problems, and you won’t have to worry about previous mulch debris mixing with it. Rubber Mulch can be installed over your previous wood mulch, but make sure the wood mulch has had time to decay and become compacted. How do I maintain Rubber Mulch? Simply use a leaf blower or a rake to remove yard debris. Rubber Mulch will not decompose. If fading begins after at least 12 years, you can either top-dress it with fresh Rubber Mulch or till it into the soil. Rubber Mulch is safe to till into the soil because it is nontoxic and acts as an aerator to help keep the soil from compacting. Similar rubber products such as crumb rubber are being used for the same purpose in athletic fields all across the country. You can also rake up your faded mulch to use as landfill. What kind of insulation does it provide? Rubber Mulch keeps soil 10° cooler in summer and 10° warmer in winter. Rubber Mulch does not absorb water, it will not freeze. Rubber Mulch is not flammable. Tire chips were tested in 1995 in accordance with the Federal Hazardous Substance Act (16 CFR 1500.44) to determine whether this material would be considered "flammable." (A material is considered flammable if it ignites and burns with a self-sustained flame at a rate greater than 0.1 inches per second along its major axis.) Per these test results, scrap tire material is considered nonflammable. What if a child swallows a rubber nugget? *If a piece of rubber is swallowed, it should not cause any acute or chronic problems. Short-term issues, such as an upset stomach, will be a function of the amount of rubber swallowed. As to the fate of the rubber chips swallowed, they are eventually evacuated from the body, just like any other indigestible material. How can I use Rubber Mulch with horses? Rubber Mulch is great for horse arenas and stalls. It is easy on horses’ joints when they step on it, and it is dust free. Many of our customers mix in the rubber mulch with sand and dirt. Has Mulch Direct Rubber Mulch been certified by outside agencies? Mulch Direct Rubber Mulch meets all of the criteria established by the International Playground Equipment Manufacturers Association (IPEMA) and complies with ASTM F1292-04, Standard Specification for Impact Attenuation Under and Around Playground Equipment. As part of our goal of offering high quality at an affordable price, we also offer a delivery system which is convenient and economical. 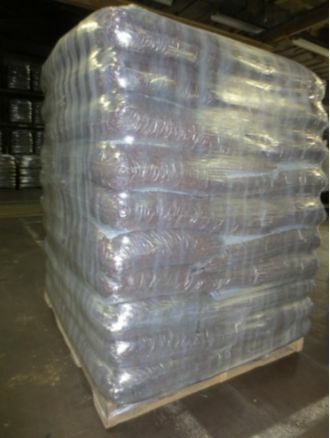 Samples: Samples of mulch will generally be delivered within 5 business days. Mulch Orders: Most orders will be delivered within 5 - 7 business days. Our delivery company will call you prior to coordinate. Return of unopened packages are accepted within 30 days of receipt of product if accompanied with a valid RMA # supplied by contacting MulchDirect.com. Customer is responsible for the initial freight cost incurred by MulchDirect as well as the cost of return freight. Additionally, there is a 15% restocking fee. Refund will be issued upon receipt of returned merchandise at our facility. Please note: Freight shipping can be costly. Questions? Call us at 800-778-6852 or email us. Enter the dimensions for your playground or landscape and click the "Calculate" button. © 2017 Mulch Direct. All rights reserved.